2014 CrazyFly Taurin 5'8" Kite Surfboard, Fantastic All-Around Small to Medium Wave and Light Wind Performance. 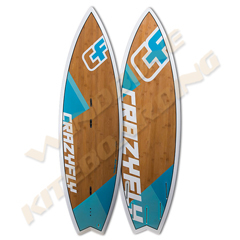 The 2014 CrazyFly Taurin 5'8" Kite Surfboard from CrazyFly Kiteboarding offers well rounded control in an ultra durable kite surfboard with top quality materials, construction and performance. 2014 CrazyFly Taurin 5'-8" Kite Surfboard - "Agility and response in waves.."
The 2014 Crazyfly Taurin 5’8” Kite Surfboard is designed for small to medium waves and is also a fun board to play with on lighter wind days. With a swallow tail and narrow nose shape, the 2014 CrazyFly Taurin sits firmly in its course and allows the rider to easily engage a lot of rail and carves extremely well. The center of the board is wider and contains most of the volume, which is essential for light wind performance. At its size, the Taurin is suited for intermediate to advanced riders who are looking for a solid board ready to rock in smaller waves. All CrazyFly surfboards are made using the custom surfboard production process. Real surfboard rails tucked in under the edge and the latest Bamboo Tech construction provide superior surfboard feel. 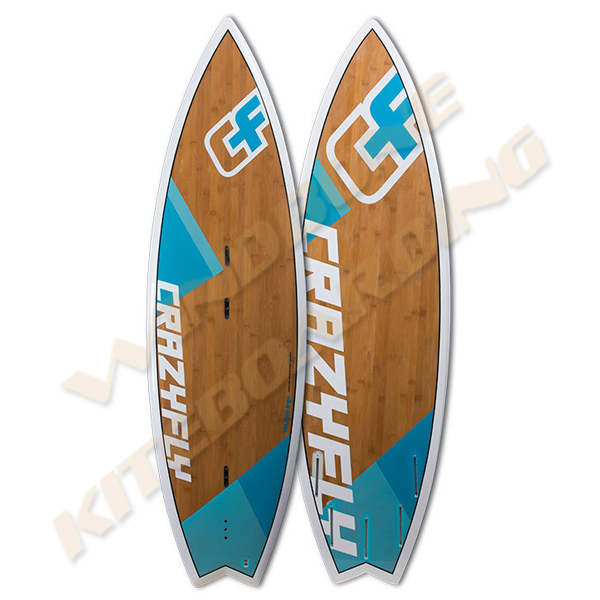 The 2014 CrazyFly Taurin Kite Surfboard received a five fin set up, so the rider can choose between all the riding options: Single, Twin, Thruster, Quad or Five fins. In addition, all CrazyFly surfboards come with high quality accessories: self-stick EVA footpads, surf straps, and original Futures® fins made in USA. Authorized CrazyFly Kiteboarding Dealer Specialists.